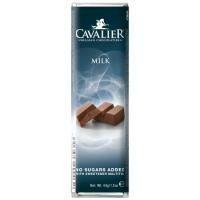 A "Cavalier" chocolate bar, type "Milk", with Maltitol instead of sugar. Cocoa solids: min. 37 percent. 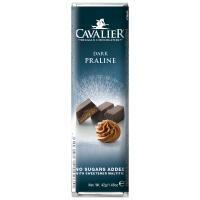 A "Cavalier" chocolate bar, type "Praliné Milk", with Maltitol instead of sugar. Cocoa solids: min. 37 percent. 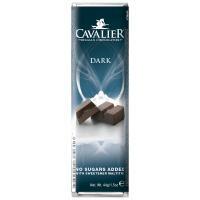 A "Cavalier" chocolate bar, type "Dark", with Maltitol instead of sugar. Cocoa solids: min. 55 percent. 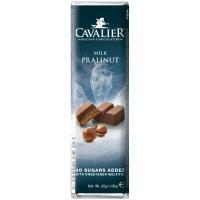 A "Cavalier" chocolate bar, type "Praliné Dark", with maltitol and lactitol instead of sugar. Cocoa solids: min. 55 percent. 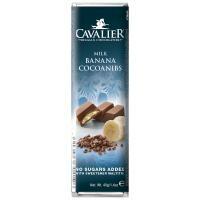 A "Cavalier" chocolate bar, type "Banana Cocoanibs Milk", with Maltitol instead of sugar. Cocoa solids: min. 37 percent. A "Cavalier" chocolate bar, type "Strawberry Raspberry Dark", with maltitol and lactitol instead of sugar. Cocoa solids: min. 55 percent. A "Cavalier" chocolate bar, type "Mocha Dark", with maltitol and lactitol instead of sugar. Cocoa solids: min. 55 percent. A "Cavalier" chocolate bar, type "Orange Dark", with maltitol and lactitol instead of sugar. 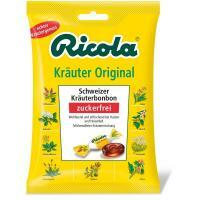 Cocoa solids: 55% minimum. A "Cavalier" chocolate bar, type "Lemon-Lime Dark", with Maltitol and Lactitol instead of sugar. Cocoa solids: min. 55 percent.